Legowelt (aka Danny Wolfers) began producing music in the early-90s from his bedroom studio in Scheveningen Beach and now some 15 years later, he has played live all over the world and released an almost countless amount of music under all manner of names from Dickie Smabers & The Moerwijk Crew to Nacho Patrol, Franz Falckenhaus, Jackmaster Corky, Smackos, Danny Wolfers, The Chicago Shags (with Orgue Electronique) and many more. Yet it is as Legowelt that he has become most well known, inspiring generation after generation of people across the world to listen, dance and make new music bursting with emotion and sweat. A year after he released his previous album as Legowelt, ‘The Teac Life’, as a free download, he is back with a new opus. 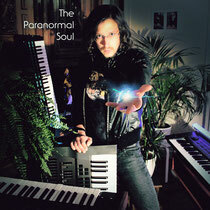 ‘The Paranormal Soul’ collects 12 previously unreleased tracks that see Danny Wolfers continue to mangle up the historical foundations of New York, Detroit, Chicago and early UK rave, mixing it with seedy witchcraft rituals and deep space psychedelics for a boundless journey into techno mysticism. From the opening sinister Drexciyan strings of ‘Danger in the Air’ to the swirling acid house implosion of ‘I Only Move For U’ and deep techno throb of ‘Rave Till Dawn’ Legowelt manages to weave all the elements of the acid house cosmos into a stunning new long play set.